In reality most Americans are winging it when it comes to their retirement plans. The plan for most will be the default with Social Security which was never intended to be the primary source of incomes for millions of Americans. The new retirement is no retirement and working well into old age. If that’s you here is how to avoid such a future. The above introductory comments are edited excerpts from an article* from mybudget360.com entitled Winging it through retirement: 30 percent of Americans have no retirement savings. Planning for retirement does not happen overnight. You need to diligently plan and sock away savings like a squirrel stocking up for the season. [That seems to be too much to expect, however, from the] many Americans who have no retirement savings and…[for the] many near retirement who face a compressed timeline where they will need to save [aggressively] or face a massive decline in living standards in their later year. Retirement has become a sort of idealized vision of doing nothing. Many think that once retirement hits, all expenses will go away and that they will have unlimited funds to purchase Margaritas and spend time at a beach with crystal blue water in some part of the Mediterranean. Instead many will be working deep into older age and will be fighting off the cold because the heating bill is eating into their Social Security check. Many Americans are completely unprepared for retirement and despite the massive surge in the stock market since the Great Recession ended, many Americans are looking at retirement and are planning to wing it. There is a deep cognitive dissonance in our culture. We are obsessed with planning yet people fail to prepare. We have an obsession with eating right and staying healthy but are one of the fattest nations on the planet. This kind of split mentality helps to explain why, in a country with so many retirement plans and options, most people are inadequately prepared for retirement. Those 18 to 29 would have a big advantage in their future years if they only socked away a few bucks per month, yet half of this group has nothing saved. Those 30 to 44 don’t do all that better. 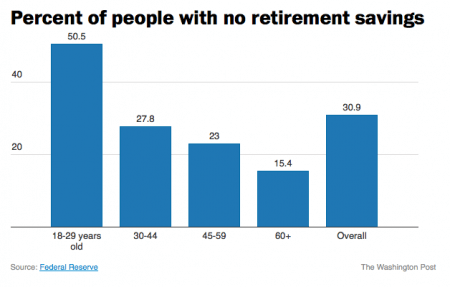 Ultimately, 30% of all Americans have no retirement savings. This is troubling. 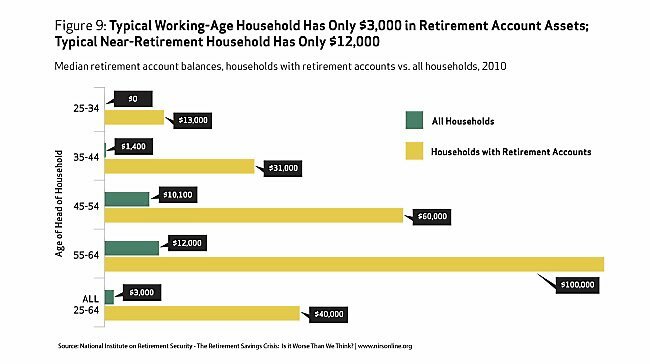 Furthermore, when you look at how much is saved you realize that even those with some kind of retirement savings are virtually focusing on Social Security as their main source of income. The typical near-retirement household only has $12,000. This is one minor medical emergency away from being fully bankrupt. Why are Americans so unprepared for retirement? For most Americans they are living paycheck to paycheck. For many others, there is little left from the paycheck once the necessary expenses are paid. The typical American makes $26,000 per year and, with inflation eroding purchasing power, those dollars are not going very far. The immediate needs of the day take precedent over the potential problems of the future. The unfortunate aspect of all of this is that it would take only a few hundred dollars per month starting at an early age saved to have a decent sized nest egg but people don’t see the value in that. It is an all or nothing kind of mentality…When people look at the end goal of needing $500,000 or $1 million for a nest egg they simply get overwhelmed. [They needn’t be.] Any financial advisor would be more than happy to step in and take your money if you are unwilling to do the research [but, unfortunately,] many Americans also distrust the financial sector which only compounds the problem. 19. Retirement Age Keeps Going Up – When Will You Retire? Previous Noonan: What’s It Going to Take to Cause a Sharp Price Reversal for Gold & Silver?